This article looks at why customers expect different interactions with you depending on where they are in the buying cycle. It also examines how specific events trigger them into a buying mode. It then explains how you can use this information to make your marketing more effective. Awareness – when a customer first becomes aware of your product. Or could also refer to the point where a customer first becomes aware of a need that they want to fulfill. Imagine that you wandered in to a clothing store while walking around the neighborhood. You didn’t have a particular idea of anything you want to buy. You are approached by a hungry salesperson who is convinced they can get you to buy something. You are are annoyed by too much attention, and feel that they are ruining the peaceful browsing experience that you hoped to have. Now imagine that you have gone into the same store. However In this situation, you have a urgent need to purchase a black sweater, and don’t have much time to waste. You want a salesperson to help you immediately, so you don’t waste your time looking for the item. However you can’t seem to get the attention of any of the salespeople. You are highly irritated by the lack of attention. The difference between these two examples is where you are in the buying cycle. In the first situation, you are early in the Awareness stage, and in the second example, you are right at the end of the purchase cycle. Depending on where you are in your buying cycle, your expectations for how the sales people in the shop should treat you are different. If you are early in the cycle, you want to be largely left alone to browse around and get educated. If you are later in the cycle, you want highly responsive help to complete the purchase. Using the wrong sales approach leads to buyer frustration. How do you adapt Marketing to a buyer’s stage in the cycle? In the online world, we need to provide different paths through the website that are appropriate for each stage. It turns out that visitors will self-identify where they are in the buying cycle by the paths they take, provided you give them the option. Since visitors who are early in their buying cycle are NOT likely to buy on their first visit to your web site, we need to know how to best handle them in case they do turn into buyers later on. This is a path that I am surprised to see is often not given the right level of attention and results in leads leaking from the funnel and lost marketing investment. The key is to do a great job of staying in touch with them over a period of time, and building a trusted relationship (Lead Nurturing). Then if they do hit an event that triggers a buying cycle, your product is likely to be the top of their shopping list. To allow us to do this, we need their email address. Since website visitors are initially reluctant to provide that, we need to entice them with something of value to them. How to do this has been covered in other articles in this blog (When selling is the worst way to win customers & Optimizing your customer acquisition funnel). Once we have their email address, we can nurture them through the buying cycle using a customer success stories, a blog, newsletters, webinars, etc. Lead nurturing is best done with marketing automation software like that provided by HubSpot, Marketo, Eloqua, etc. Those products allow you to segment your customers to make the messages you send most directly relevant to them, and therefore most likely to be read. They also allow you to track who is advancing in their buying process by observing whether they come back to visit pages, such as the pricing page, that indicate buying intent. You can then apply more expensive sale resources to those leads, knowing that they are qualified enough to warrant the additional cost. Effective lead nurturing is all about accelerating leads through the consideration process. Customer success stories, product comparisons, etc. all help to provide the data and info that a prospect looks for in their own research. If you provide it for them you make it easy for them to consume that info and move to the step in the process. People that are later in the buying cycle are most likely to be using tools like Google, and review sites to search for vendors and products to solve a problem. Those leads are highly valued because there is a high level of buyer intent. They are usually in the Consideration or Purchase stages of the buying cycle. Many other lead sources (e.g. social referrals, Twitter, Facebook ads, banner ads, pr stories, educational presentations at conferences, etc.) produce buyers that are earlier in their cycle, and frequently just becoming aware that there is a potentially interesting product now available. Market maturity also plays an important role in the stage that your leads. For early stage markets where there is still a lot of education required, most leads will be very early in their buying cycles. A Counterfeiting Operation Ripped Off 2 Inventors. Then They Fought Back, and Won. When a company copied their invention, Natasha and Fred Ruckel began investigating — and got an inside look into how products are ripped off. On Valentine’s Day in 2015, Natasha Ruckel and her husband, Fred, were sitting in their living room in Gilboa, N.Y. Natasha was improvising on the piano, and Fred was listening while messing around with the couple’s cat, Yoda. Fred noticed a ripple in the living room rug, forming a half circle on one side. Again and again he tossed toys into the ripple and a delighted Yoda darted in and out. Natasha looked up from her playing. “That’s when we came up with the idea for the Ripple Rug,” she says. The Ruckels, who had spent around 25 years earning their living in marketing and advertising for brands from PepsiCo to ESPN to Hasbro, were already in the midst of creating their first venture: an app that provided a way for amateur photographers to monetize online images. But they both agreed that the Ripple Rug was a better bet. A couple of days later, Fred went to Home Depot and bought some cheap pieces of carpet, and they got to work on a prototype. When they had that, they launched a Kickstartercampaign in May 2015, pricing the American-made product at $39.95, to test the market. Within 30 days, they received $15,000 in backing. They had the products made in Georgia for $15 each, and filled the orders. The Ruckels were weighing their next step when, that fall, the opportunity of a lifetime hit. QVC, in conjunction with the Today show, hosted an ongoing competition called the “Next Big Thing” for entrepreneurs with new retail products. Participants presented their offerings on the TV program, and the winning products received an order from QVC. It was, and it wasn’t. Over the next 14 months, the Ruckels learned that coming up with a truly original innovation attracts not only devoted customers but also the kind of highly organized, deep-­pocketed bootleggers who rip off products and systematically grind their inventors into the ground — both financially and emotionally. “It creates so much discord that you are willing to give up the dream of entrepreneurship and go back to your day job,” says Fred. In the thick of battle, however, the Ruckels learned critical lessons: the importance of copyrighting assets before launching; the reality that people will steal everything from your marketing pitch to your product to your advertising photos; the need to continually patrol for ripoffs and take action. They also got a darkly fascinating glimpse of how ruthless, well-funded, deeply sophisticated bootlegging operations work — and how, with tenacity, vigilance, a good lawyer and the right strategy, they can be beaten. Are there any free tools for SEO? There are plenty and I’ve tested many. Not only will these put you on a better path for the rest of the year, but they’ll position you for success once the new year begins. Here are the top 10 tools that I want you to focus on. Why should you be using this free tool? The answer is simple: because you need to understand everything about your target audience and the people visiting your website. With this data, you’ll better understand where your traffic is coming from. You can then adjust your digital marketing strategy to take full advantage of your top channels. In this example, the website is receiving a lot of direct traffic. While that’s great, it’d be nice to increase the diversity a bit, maybe by focusing more time on organic search and social networks. Once you install Google Analytics, the tool does all of the work for you. Give it some time to collect enough data and then begin reviewing the results daily. Christmas 2017 is upon us! Children worldwide will soon be comfortably tucked into their beds as they anxiously await the arrival of Santa Claus (a.k.a. Kris Kingle). This is a great time of the year to be young, or at least young at heart! Several years ago we profiled the Top 10 Iconic (and Patented) Toys in our Christmas Eve edition. This year we decided to profile the most iconic and patented games, many of which are still likely to be found waiting for good little girls and boys under the Christmas tree. Profiled are Monopoly®, Rubik’s Cube, Battleship, and Rock’em Sock’em Robots, Twister and Simon. We also want to take this opportunity to wish everyone a very Merry Christmas! Thank you for reading IPWatchdog.com! In 1935 the United States Patent and Trademark Office (USPTO) issued U.S. Patent No. 2,026,082 on Monopoly®, one of the most successful and beloved board games of all time. As the story goes, Charles Darrow, an unemployed salesman, was struggling to support his family during the Great Depression. It was during this time that he claimed to have fondly remembered summers in Atlantic City, New Jersey, and dreamed about being a real estate mogul. These diversions purportedly lead to him formulating what has become the most popular board game of all time – Monopoly®. Darrow felt certain he had a hit on his hands so he contacted Parker Brothers, who initially turned him down, but only after explaining that his game violated some 52 fundamental rules of a board successful game. Undeterred, Darrow marketed the game himself. As fate would have it, a friend of Sally Barton, the daughter of Park Brothers’ founder, George Parker, bought the game. At the time Mrs. Barton’s husband was the President of Parker Brothers. One thing lead to another and eventually Parker Brothers became convinced that this game, with minor modifications, could be a huge success. As a result of his invention Darrow became the first millionaire game inventor, thanks to royalty payments. The irony, however, is that Darrow may not have invented the game at all, but rather he may have taken a locally popular game and made only a few changes. By the time Parker Brothers realized that Darrow might not have been the true inventor the game was already a huge success. To protect the game and its investment the decision was made to buy up all patents and copyrights on any related game, thereby ensuring the monopoly on Monopoly®. One of the most popular games of the 1980s was the Rubik’s Cube, a puzzle game that proved enormously frustrating to many who attempted to unlock its solution. Invented in 1974 by Hungarian inventor Ern? 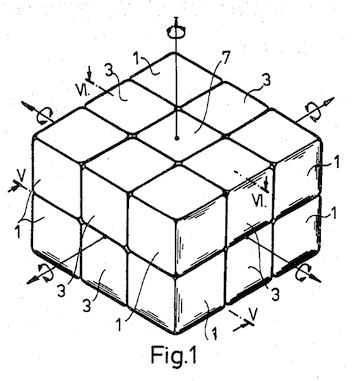 Rubik, the device was patented in the United States with the issuance of U.S. Patent No. 4,378,116 on March 29, 1983, with the title Spatial logical toy. On a classic Rubik’s Cube, each of the six faces is covered by nine stickers, each of one of six colors: white, red, blue, orange, green, and yellow. See Wikipedia. A Rubik’s Cube craze captured worldwide attention in the 1980s, with tournaments and even the Guinness Book of World Records recognizing the fastest attempts to solve the puzzle. Today the Rubik’s Cube has been a part of pop culture for decades, and has once again gained a new following with over 40,000 YouTube pages dedicated to the puzzle game. Another long time favorite game is Battleship. U.S. Patent No. 1,988,301 was issued on January 15, 1935 under the title Game board, the originally patented game does not bear a lot of resemblance to the one that many of us grew up playing. 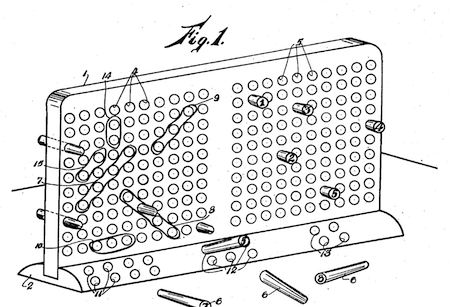 The patent explains that the invention relates to a perforated game board and pins insertable in the perforations. Although the patent explains that this perforated game board could be used for number of different games, the game we know as Battleship is described. U.S. Patent No. 3,235,259, titled Toy boxers, was issued on February 15, 1966. 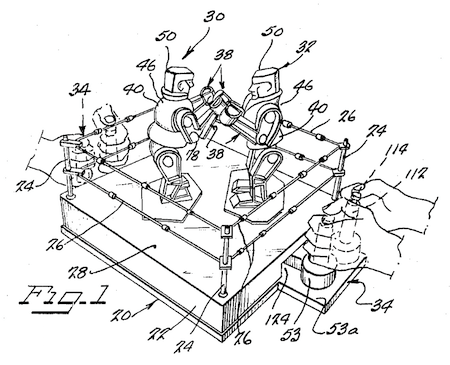 The patent explains: “It is the primary object of this invention to provide a new and amusing toy in the form of a novel boxing game manually operated by opposing players.” Inventors Marvin Glass, Harry Disko and Burton Meyer, assigned the patent to Marvin Glass & Associates, and the first version of the Rock’em Sock’em Robots game was manufactured by Louis Marx and Company in 1964. Rock’em Sock’em Robots was a game of battling robots, with each player trying to knock the others head off the block. The Red Rocker and the Blue Bomber would battle it out inside the ring. Designed for two players, this boxing game required each player to a robot by operating the mechanism with his or her thumbs. Twister has to make this list just because of the patent art on display in Fig. 3 (to the left) alone. The game is played with a playing surface the size of a large blanket, which has “a plurality of columns of loci, said loci being of such size and so spaces as to enable the players to place a hand or a foot on any designated locus, the columns of loci being different colors…” Don’t you just love the way patent attorneys write? 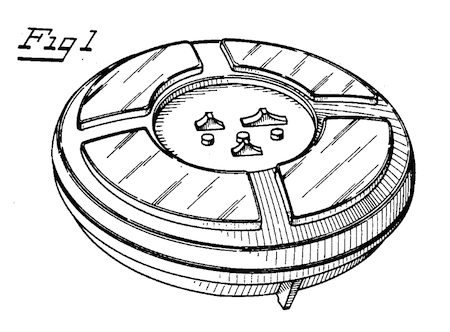 A “chance device” such as a spinner is included with the game. Someone not playing (i.e., a referee) will spin the wheel and call out a hand or foot with a corresponding color, which requires the players to twist and contort themselves in order to place the appropriate hand or foot on the color. The object of the game is to move into the appropriate position without falling. If a player falls or touches an elbow or knee to the surface the game is over and the other player declared the winner. Ralph Baer, Hall of Fame inventor of the video console, was also the co-inventor of this extraordinarily popular, frustrating, and fun game. Baer, along with co-inventor Howard Morrison, invented this electronic game in the late 1970s, and launched in 1978. U.S. Design Patent No. D253,786 was issued on Christmas Day 1979 (Fig. 1 of the patent shown left). While that might seem odd to many, the United States Patent and Trademark Office issues patents every Tuesday, and December 25, 1979 happened to be a Tuesday. Obviously, all the work to allow the patent to be done was complete well in advance. In the U.S. a patent is not officially issued until it is published, which occurred on Christmas Day 1979. For those not familiar with this iconic game, the device is made up of four colored buttons, which light in a series. The player must repeat the sequence correctly once the lights stop. Each time the player successfully completes the correct sequence the sequence becomes longer, and as the player continues the sequence gets faster and faster. This game can still be purchased today, but the new age Simon Optix seems more virtual reality headset than anything else. In an attempt to keep the game fresh for the next generation you wear the headset and wave your hand in front of the proper color in sequence. Other varieties of this classic game include the Simon Swipe and Simon Air. PLANO, Texas, Dec. 13, 2017 /PRNewswire/ — Families that play together can invent together. Frito-Lay Variety Packs, one of the flagship brands from PepsiCo’s Frito-Lay division, is calling on families to dream big in the second year of its “Dreamvention” program and submit ideas to solve an everyday problem for a chance to win $250,000. Frito-Lay, which initially created Dreamvention after seeing so much ingenuity from families in their daily lives — from big inventions to daily life hacks — is bringing the program back after receiving thousands of creative ideas in its first campaign. After all, Frito-Lay Variety Packs believes that if you can dream, you can invent. Families can submit invention ideas and learn more about the program starting now at MyDreamvention.com. Cobie Smulders, a mom of two young children who knows the importance of spending meaningful time with family and making each moment count, is helping Frito-Lay encourage families to brainstorm invention ideas together. Smulders, best known for roles such as Robin Scherbatsky from “How I Met Your Mother” and Maria Hill from the Marvel Cinematic Universe, has long had a passion for creativity and scientific endeavors — she was even an aspiring marine biologist in her youth before she pursued acting full time. You can also “Dreamvent” on-the-go! Frito-Lay Variety Pack features pre-portioned, single servings that can be taken with you wherever you go. Variety Packs include everyone’s favorite Frito-Lay snacks, such as Cheetos cheese flavored snacks, Doritos tortilla chips, Fritos corn snacks, Funyun’s onion flavored rings, Lay’s potato chips, Rold Gold pretzels, Smartfood popcorn, and SunChips multigrain snacks. Variety Packs are available at retail stores nationwide for a suggested retail price of $2.69 – $13.99. Once your patent has been awarded you may still need additional capital to turn that patent into a business. Fortunately it is not as difficult to find investors as you may think. Equity crowdfunding is on the path to surpass venture capital as the preferred way for start-ups and small businesses to raise capital. In a nutshell, equity crowdfunding is the sale of equity (or debt) in your business directly to investors using an online platform instead of a stock brokerage firm. It is also less expensive than hiring one. Although direct to investor funding over the internet has been around since the late 1990s, it came of age with the JOBS Act in 2012. The JOBS Act provides for three regulations that govern distinct types of offerings. The offerings differ by how much money you can raise and from what type of investor you can raise it from. Regulation A (Reg. A) permits offerings of up to $50 million dollars. This is a “registered” offering meaning that the company needs to file a registration statement and investor prospectus with the Securities and Exchange Commission (SEC). An audit of the company’s books for the two most recent years is also required unless the company has been in operation for a shorter period of time. There are two main benefits to an offering under Reg. A. The first is that you can solicit and obtain funds from any member of the general public including younger millennial investors. This might be a benefit to a company whose product is targeted to this audience, like a video game company or a company whose technology might interest younger consumers as opposed to baby-boomers. The second benefit is that once the offering is complete, the shares you have registered are freely tradable in the public market including the NASDAQ or New York Stock Exchange. There are specific listing requirements for these markets, but companies that go through this process then have access to mainstream capital markets. Also if the company does well, the shares are liquid and can be sold by the insiders. The downside of Reg. A offerings is that they are time consuming and expensive. It can take 6 months or more for lawyers to prepare the paperwork and for the SEC to review, comment and approve an offering. Legal and accounting fees alone can easily reach 6 figures. There is also an annual audit and given that you will likely have thousands of small investors; you will probably need at least one employee to deal with investor relations. There is also the cost of finding those thousands of investors. There have been several successful Reg. A campaigns that have raised $10 million or more. The upfront marketing costs for an agency to design and execute a campaign to reach those investors can also be substantial. If you are using Reg. A to raise $10 million or more, a budget of $250,000 or more would be appropriate. On the lower end of the scale is Regulation Crowdfunding (Reg.CF) which allows companies to raise up to $1,070,000 per year directly from the general public. There is no need for an audit if the raise is less than $107,000 and above that only a CPA review, not a full audit of the last two years is required. There is no SEC review process, just a filing. Anyone can invest although investors of lesser means are limited to a total investment of $2200 or 5% of the lesser of the investor’s income or net worth within each calendar year. It is not unusual for a company raising $1 million to have thousands of shareholders who put up $100 each. As with Reg. A the legal and marketing costs can add up. A Reg. CF offering must be made on a crowdfunding portal (website) which in turn must be registered with the SEC. At this time there are about 30 portals that have registered and some are better than others in terms of their visibility and reputation. Several specialize and only host offerings for companies involved in green energy or companies owned by women or minorities, etc. Selecting the right website or portal can be crucial to your offering’s success. Most companies find that the most cost-effective way for them to raise funds is Regulation D. Reg. D is an exemption from the registration requirements of the federal securities laws. It has been around since 1982 and today is an active $1.7 trillion per year market. That is much more than traditional public offerings or venture capital. Traditionally these private placements were sold through stock brokerage firms and many still are. The firms and issuers were always limited to making these offerings only to people with whom they had a prior business relationship. The JOBS Act changed that to allow issuers to advertise and solicit investments from accredited investors, those whose income is over $200,000 a year or possess over $1 million in assets outside of their primary residence. The vast bulk of the money raised through equity crowdfunding is raised using Reg. D. As a practical matter the cost of preparing the legal paperwork is usually less than with either Reg. A or Reg. CF. Accredited investors are presumed to be more sophisticated and the amount of information that needs to be provided is usually less. At the same time, they often ask more thorough questions before they invest. The company will have to designate a knowledgeable person to help investors who want to kick the tires. Accredited investors are relatively easy to reach and because they are taking a larger slice of each offering (often a $10,000 -$25,000 minimum investment) issuers need to reach out and connect with a far smaller group of potential investors. This substantially reduces the upfront marketing costs. In sum, a Reg.A offering raising $5 -$10 million can cost several hundred thousand dollars whereas a Reg. D offering, raising the same amount, may cost less than $50,000. You can use Reg. D for a $1 million raise as well and unlike Reg. CF if you get a good response you can accept more than $1 million to provide your business with some extra cash. Unlike venture capital or angel investors with equity crowdfunding the company seeking funds controls the process and the terms. The hard part is to present to investors a better deal that will make yours a more attractive investment than the other offers they receive. There are multiple ways to structure a Reg. D offering that provides investors with a good return on their investment. For patent backed ventures; a licensing, royalty or revenue sharing structure is often possible. That allows the company to structure the financing “off the balance sheet” in a way that the owners of the company retain ownership of 100% of the equity. There is no way to sugar-coat the fact that 90% of start-ups fail. A study published by MIT last year suggested that the likelihood of growth is 35 times higher for firms that apply for patents. That fact is not lost on investors, but you may want to remind them of this fact when you are seeking their investment. That is one of the reasons that I am working with PatentAngels, an IP-centric investment platform that is focused on Reg D offerings for companies with registered patent rights. The IP aspect increases the level of certainty for investors, especially when making investments online and they may not be able to meet the management team in person as traditional VC’s do. Think about it, if you made an online investment in a company with multiple unknowns, would you rather know they at least have their technology patented? Get dressed. By that I mean get your corporate books and financial statements in order. Have your Board of Directors in place and make certain that they are people who have some experience to the business that you are in. Have a detailed business plan that is well researched. Any investor will discount your financial projections but that does not mean that your projections should not be based in reality. Know your market, your customers and your competitors. Hire the right people. Having a patent is great, but investors expect execution. You are going to need marketing and sales executives and a CFO. Hire them or at least identify them so that investors can evaluate their skills and experience. Know how much money you need and be prepared to describe how you will spend it. A line item that says “general overhead” does not tell investors what they want to know. If you need office or manufacturing space, you should have a good idea of how much space, where it will be located and how much it will cost. You should be able to estimate how much each executive salary and benefits will cost and how many other employees you will need. Equity crowdfunding has created a new, intelligent and efficient way for small companies to access the capital markets. If you have taken the time and expense to obtain a patent for your product, it is certainly worthy of your consideration.